From this angle, you can see the lettuce piled high on whole grain bread and perhaps a hint of the ruby exterior of the lower half of a French breakfast radish. And if you look closely, you can see the not-too-thick, not-too-thin layer of easy egg salad for one. This sandwich takes mere minutes to whip up, but it feels like something special. Working at home, it’s easy to fall into habits when it comes to lunch. Going out for a sandwich, for instance, because it’s easier than making your own. Or picking up something from the grab-and-go at the grocery store because you are there anyway. Or slapping together a thin, boring sandwich because it’s easier. Ultimately, these all aren’t really that awesome. You are either taking a whack at your budget (take-out adds up!) or find yourself eating because it’s time to eat. Shouldn’t eating be fun? And can’t it be fun without digging into your wallet? To make this easy lunch for one, you start with a few simple ingredients for the egg salad: hard-cooked eggs, salt, pepper and mayo. Don’t worry: your eggs don’t need to be dyed like these. 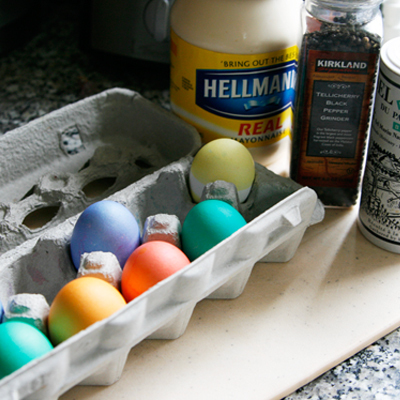 But if you have leftover eggs from Easter, this is a perfect use for them. 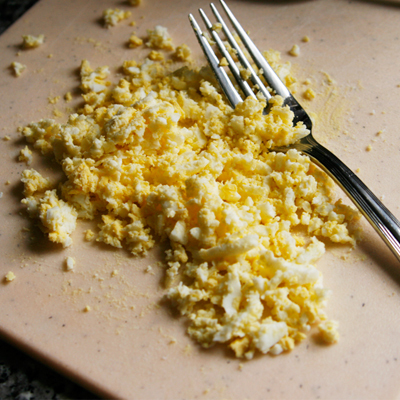 You peel the egg and then mash it with the tines of a fork. Easy. And if you are super short on time, buy pre-cooked, pre-peeled eggs from the grocery. They are a huge timesaver. The egg should look like this when you are done. Now, you are almost done. Stir in a little mayo, salt and pepper until the egg salad just holds together. Then spread it on a slice of toasted whole grain bread. Top with the radishes and lettuce. Close it up and enjoy. Who says you can’t eat well, even in the middle of a workday? Remove the egg from its shell, discarding the shell. 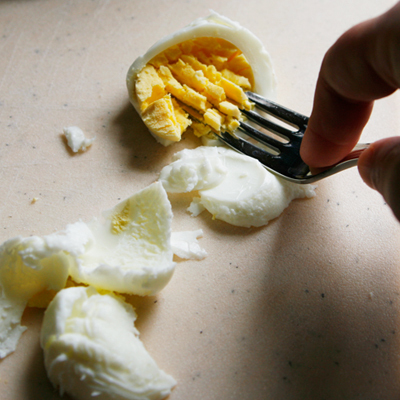 Using the tongs of a fork, mash the egg. Stir in the mayonnaise, salt and pepper until thoroughly mixed. 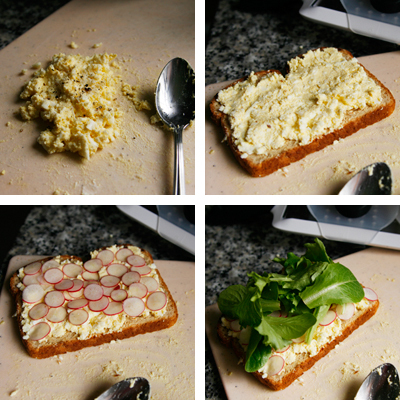 Spread the egg salad onto one slice of the whole grain bread into one even layer. Top with very thin slices of radishes and a pile of baby greens. Top with the other slice of bread. Cut in half. 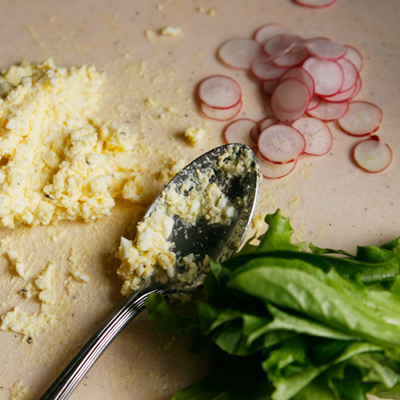 The idea of radishes with your egg salad is brilliant. This comment totally made my day. Thanks, Kate! I love that you added texture to the sandwich… I find that if a sandwich appeals to different senses it is more satisfying. I totally agree. 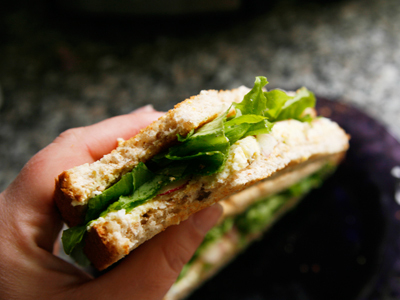 Egg salad on white can be a little one-note (but delicious). Love egg salad! I make a very similar version. Do you? I’d love to hear about yours.